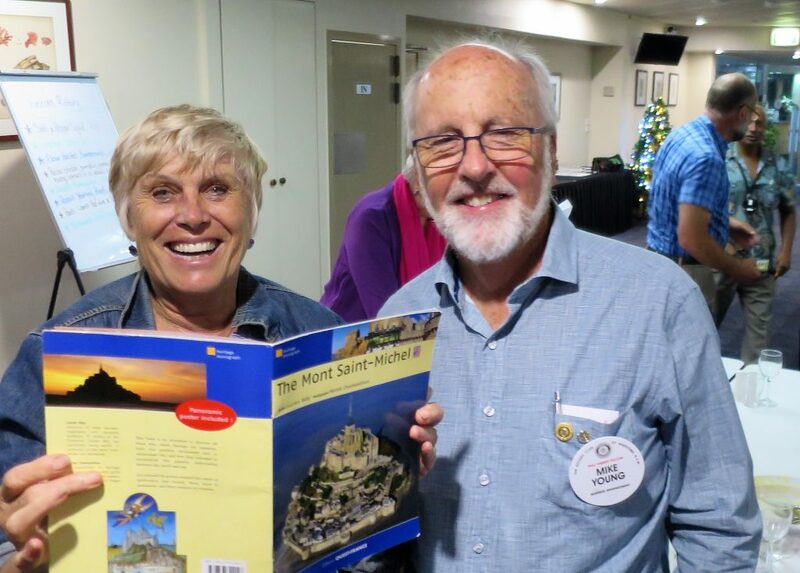 December 2018 – Narooma Rotary Club Inc. This will be the last Narooma Beacon until mid-January. However we will be quite busy in the interim. President Rod as well as several others were away last Thursday; we had 14 members with Vice President Laurelle in the chair. Laurelle organised two rounds of Trivia – one was a ‘Who’s who’, the second round was a combination of local historical and Christmas trivia. Chris O’Brien was the winner, with Lynda Ord a close second. We combined some happy moments e.g. Mike’s diversion to Young on a recent road trip to pick up some baseball caps emblazoned with ‘Young’ (guess what’s in the family’s Christmas stockings this year) with hearing about one of the many highlights of Ang’s recent European trip – a visit to the wonderful Mont St Michel. Meanwhile Charmaine was busy enlisting the help of members to sell duck tickets (proceeds will top up our scholarship fund). During the AGM, former President Bob Aston will present his annual report for 2017-2018 which was a very successful year. We will then try and finalise our Board for 2019-2020. At the stage of going to press we still had no nomination for President. You may remember that last December the Club awarded Alicia Bate the 2018 Tertiary Scholarship; she’s been on a gap year this year. The panel was also so impressed with another candidate Tahlia Arnold and her desire to do well at university, they awarded her a one-off scholarship of $3,000 for 2018. Tahlia has now completed her first year studying Psychology at the University of Wollongong with fantastic results. During this week, Lynda Ord received this wonderful note from Tahlia. My family and myself are very proud of my marks, especially my stats result (a HD!). I’ve been taking some Indigenous Studies electives, and hopefully, I will soon be able to claim a minor in either Indigenous Studies or Australian Studies. I think that will be a nice bonus to my Psychology major. I’ve made quite a few friends at International House, and I’m pleased to say that some will be staying at iHouse again next year, so I’ll have a good group of friends to hang out with again. Some have even invited me to stay at their homes in Japan! One day in the future, I’ll take them up on their kind offer. A wonderful outcome and big smiles all around! The Board decided this week to award Tahlia an additional $1,000 in recognition of her outstanding results. Hopefully she can join us at our Youth Night in February. The Drought Relief Appeal launched by Rotary Australia, the National Farmers’ Federation and Channel 9 in August raised over $10m to support drought-stricken farmers. The appeal closed at the end of September. The donations were administered by Rotary Australia and distributed to farmers in need with the help of the National Farmers’ Federation. Funds were distributed through the CWA, Rotary districts, the Salvation Army and Drought Angels and were used to purchase fodder and stock water, assist with household expenses and also support mental health services. Moruya Rotarians meanwhile raised $6,000 in their own Drought Relief Project which was distributed to 20 farming families in the West Wyalong area known to be doing it tough, with the assistance of West Wyalong Rotary. Each family received a $300 gift certificate purchased in the West Wyalong business area. Not only did Moruya Club help the farmers but they were also supporting local business. Thank you to those who volunteered to man the van at Narooma’s Christmas Carols this Friday evening 6.30-9.30pm – John Doyle, Lynn Hastings, John Rungen, Mike Young and Aish Stanley. Should be good. 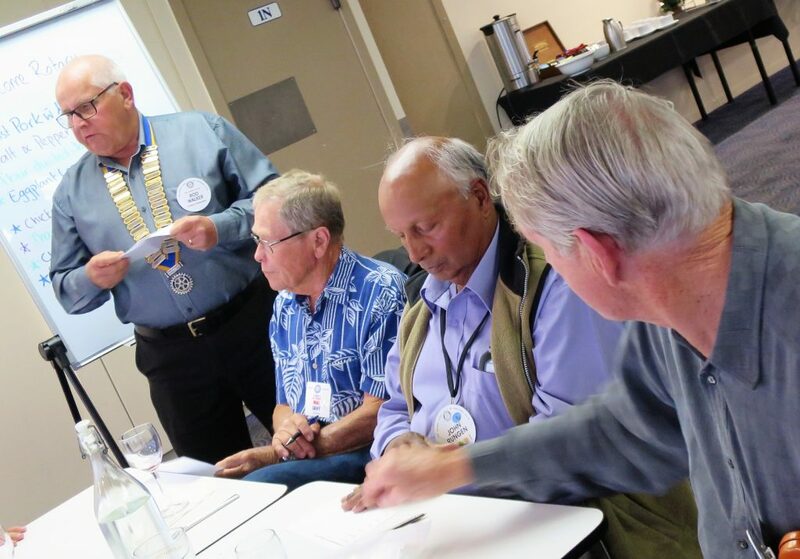 This Saturday, our three-member panel which includes President Rod will interview the seven students from Narooma High who have applied for the 2019 Rotary Tertiary Scholarship. Then it’s on to the party! The Christmas party at Casey’s Café this Saturday night gets underway at 6.30pm. If you haven’t already paid, please pay online before Saturday night; it just makes the night a lot easier. Some wine will be provided by the Club; if you want beer or spirits, please bring your own. The Club then goes into recess for a few weeks with no formal meetings until 7 February but we will still be out and about in our community. Our Markets Manager Chris O’Brien reports bumper bookings for the holiday markets on Friday 27h December, with a variety of stalls including many new ones. Everyone who will be around has put their names down for the roster; we should be very busy. We will also push our Australia Day Duck Race tickets. Our first get-together in 2019 will be in Quota Park for nibbles from 6pm Thursday 17 January and then take-away fish and chips from The Inlet. Best bring a chair and maybe throw in a small fold-up table just in case it’s needed. This will be chance to finalise arrangements for the Duck Race on Saturday 26th and the roster for the markets the following day. Our first meeting back at the Golf Club in 2019 will be our Youth Night on Thursday 7 February when we will hopefully get to meet our 2019 Rotary Tertiary Scholar. We’re hoping we might also have as guests some of our previous scholarship winners (depends on work commitments and return to uni arrangements). Have yourself a merry little Christmas and a safe one. 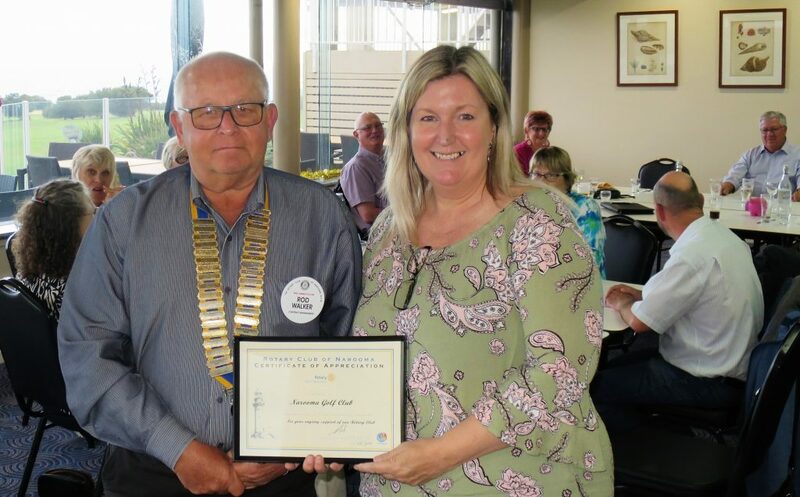 It was wonderful to have Narooma Golf Club’s Event Manager Julie Bradley join us for dinner last week and to receive a Certificate for the Golf Club. This expressed our appreciation for working closely with us to ensure our meetings run smoothly each week. Julie is our ‘go to’ person for our meetings. It was all ‘go’ last Thursday at the Golf Club for Narooma High’s Year 10 formal. The students looked fabulous and so grown up, including Julie’s daughter. Julie left us early to join in the festivities upstairs. Our International Toast last week was to the Rotary Club of the Orkneys which meets at Kirkwall for lunch. As members are aware, the Club offers a Tertiary Scholarship to a student from Narooma High to attend university or other tertiary study after they have completed the HSC. The scholarship is valued at $9000.00 over three years. It is funded from a bequest made to the Club many years ago; from time to time the scholarship is also supplemented with funds from our Charity Account. Proceeds from the 2019 Australia Day Duck Race will go to the Scholarship Fund. This year, seven students from Narooma High have applied for the Scholarship; each applicant submitted a written application, a CV and a copy of their last school report and their school reference. Students will be interviewed for the Scholarship on 15 December; the winner will be announced at Narooma’s Australia Day celebration. A big thank you to Michael O’Connor who has been busy selling raffle tickets to support the major beneficiary of the Christmas Race Day, Muddy Puddles. He has been selling them in front of IGA and at the last markets. Michael with the help of Murphy sold 27 books raising over $920.00 to help Muddy Puddles – a great effort. Michael of course attributes his success to Murphy’s salesmanship. When you enter this church it may be possible thatyou hear ‘the call of God’. However, it is unlikely that He will call you onyour mobile. Thank you for turning off your phones. If you want to talk to God,enter, choose a quiet place and talk to Him. If you want to see Him, send Him a text while driving.